The oldest ghetto in Europe has five synagogues, a Jewish museum, and a kosher restaurant. ABOVE: The Campo del Ghetto Nuovo, or "New Ghetto," in Venice, Italy. Despite the name, it was founded earlier than the adjacent Ghetto Vecchio ("Old Ghetto"). Today, the word "ghetto" has a negative connotation, being associated with modern urban slums and the persecution of Jews in Central Europe during the Nazi era. But in 1516, when an enclosed neighborhood for Jews was created in Venice, "ghetto" referred to the foundry that the district replaced. What's more, the intention wasn't to persecute Jews per se: The Venetian Republic segregated its Jews to placate the Roman Catholic Church, which had already forced the expulsion of Jews from much of Western Europe. "The Ghetto's Jews did not refer to their enforced residence as a jail. Rather, it was a biblical 'camp of the Hebrews,' a place of Holiness on the way to the Promised Land. In Verona they declared a public celebration of its establishment. For the puritanical young rabbi, Samuel Aboab, who had first seen Venice as a 13-year-old student, the city's Ghetto seemed Isaiah's Jerusalem .... Aboab's attitude tells us much about Venetian Jewry's intense efforts to order their enclosed world; his choice of words tells us even more about how these Jews identified with their community-behind-walls and gloried in it." 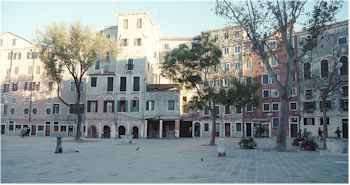 "Throughout the Mediterranean region, it was quite customary for foreign merchants to be housed in a separate quarter....When we try to evaluate the Venetian Ghetto, we must remember that sixteenth-century Venice also restricted the living quarters of Turkish and German merchants....The Venetian Ghetto always served both religious sensibilities and commercial needs. It allowed Venice to maintain its religious purity while reacting to changed economic conditions." ABOVE: Façade of the Scuola Italiana, or Italian Synagogue, in the Ghetto Nuovo. The Venetian Ghetto was a crowded place, with a population that grew as Jews and conversos (Jews who nominally had converted to Catholicism) came to Venice from other countries of Europe and the Mediterranean. By the mid-1600s, Jews controlled much of Venice's foreign trade, and it wasn't long until immigrant Jewish physicians, lawyers, and scholars played important roles in the daily business of the Venetian Republic. Apartment densities were increased by adding floors and, where necessary, lowering ceilings in existing houses. Some buildings reached six stories--an unprecedented height for Venice. Yet despite the amount of housing that was crammed into the Ghetto's modest boundaries, there wasn't enough sleeping space for the estimated 5,000 Jews who lived in the district before the European plague of 1630 that killed a third of Venice's population. "The merchants brought oriental customs with them. According to Leone da Modena, 'they prayed after the Turkish manner.' They also wore turbans, while the women wore expensive clothes, costly jewellery and tall stiff caps decorated with precious stones. A far cry from the modest habits of the German Jews. 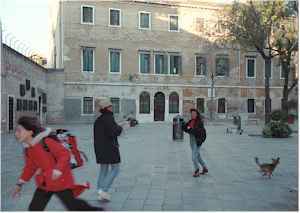 "With the arrival of the so-called nazione ponentina (the Sephardic Jews) in 1589, the Venice ghetto took on its definitive form: loan banks and second-hand cloth shops and various synagogues distributed aound the main campo....the ghetto became a centre of trade not only for Jewish residents and visitors but also for the Christian Venetians, who poured into the district every morning when the gates were opened." "...Within the gates of the ghetto there were not only places of worship and study but also a theatre, an academy of music and literary salons. The main calle of the Ghetto Vecchio was lined by all sorts of shops from those selling everyday supplies to the booksellers in Campiello delle Scole. There was also a twenty-four-room hotel at the Scuola Levantina, an inn and a hospital." As Venice went into economic and political decline in the 1700s, the Ghetto sank with it and was forced to declare bankruptcy in 1737. Sixty years later, Napoleon's troops brought an end to the Republic of Venice. The Ghetto's gates were torn down, and Jews were given the same freedoms as other citizens of Venice. Many Jews chose to continue living in the Ghetto, however, and the Ghetto remained a focal point for the Venetian Jewish community until the German occupation during World War II, when some 200 Jews were deported and killed between 1943 and 1945. The Jewish community in Venice has experienced a modest rebirth in recent years. About 500 Jews live in Venice, although the Ghetto itself has only about 30 Jewish residents. Religious services take place in either the Scuola Grande Spagnola or the Scuola Levantina. The neighborhood has several Jewish shops, a book publisher, a social center, a rest home for the elderly, a museum, a yeshiva, and a kosher restaurant (run by Lubavicher Jews whose rabbi came to Venice after 20 years in Bologna). Skip the tour if you aren't able to climb stairs, since the Ghetto Nuovo's synagogues were built above street level for reasons of space, security, and religious law. The Locanda del Ghetto is a "Town House Suites 1st Category" property (the equivalent of a three-star hotel) and has excellent guest ratings. The Kosher House Giardino dei Melograni has 14 one- to four-bed guest rooms overlooking a canal or the campo. Shabbat meals are available, and mikveh baths are on the premises. ABOVE: Bridge to the Campo Ghetto Nuovo from the Calle Farnese in Cannaregio. Walk or take the vaporetto (water bus) to the Guglie stop on the Fondamenta di Cannaregio, just above the Ponte delle Guglie bridge. You'll see a low rectangular arched doorway next to the Gam Gam restaurant. Go through the arch, and you'll be in the Ghetto Vecchio. Keep on walking to reach the larger (and older) Ghetto Nuovo, where you'l also find the Jewish Community Museum. If you're coming on foot from the Piazza San Marco or Rialto, you can turn right from the Rio Terà S. Leonardo or the Rio Terà Farsetti and work your way toward the Calle Farnese and its bridge (see photo above). Or, if you're coming from the Madonna dell'Orto Church or its vaporetto stop, head west on the Fondamenta degli Ormesini until you see a small footbridge leading to the Campo Ghetto Nuovo. Rebecca Weiner wrote this article for JewishVirtualLibrary.org. This page has basic information and a handful of Web links on past and current Jewish life in Venice. Venice actually has two Jewish cemeteries on the Lido: one old, one new. The older (and smaller) cemetery is said to be the oldest graveyard in Europe, dating back to a time when Jews were buried in sand on the edges of the Venetian lagoon. Emissaries from the Lubavitcher Rebe in New York established a local chabad in 1991; today, the community operates a rabbinical academy, a Jewish library, a chabad house, the Gam Gam kosher restaurant (see below), and a Web site that doesn't always work. Roberta Rich's historical novel, which is set in the Venetian Ghetto, has been published in the U.S., the UK, Canada, Germany, and Turkey. The menu is Israeli and Italian, the staff is Hasidic, and the food is first-rate at this kosher restaurant in the Ghetto Vecchio. If you're Jewish or simply have an interest in the Venetian Ghetto, try this newish hotel on the Campo del Ghetto Nuovo. Tintoretto's parish church is generously decorated with his paintings, and it's an easy (and pleasant) walk from the Ghetto Nuovo. At the nearby vaporetto stop, you can enjoy a view of the lagoon on your way back to the Piazza San Marco, the railway station, or the Piazzale Roma.